138# Cole Bailey 1st Place 126# Logan Martin 2nd Place 145# Kaleb Dohse 4th Place Southeast Finishes 13th as a team. Congratulations to Cole Bailey who was voted Wayne Invitational Tournament “Most Outstanding Wrestler” this weekend! 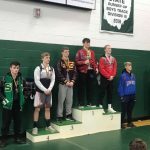 The Pirates had two tournament champions: 132# Logan Martin 145# Cole Bailey Also placing were: 152# Kaleb Dohse 3rd place 106# Nick Messina 4th place The team finished 5th overall.